Zoomer Chimp by Spin Master is a voice activated robotic chimp packed with lots of tech. My 6 and 8 year old tested out Zoomer Chimp and squealed with laughter playing with it. Unfortunately our poor family dog was less impressed by the new addition in the family. 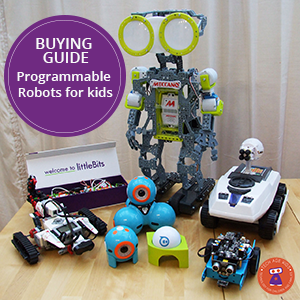 At Tech Age Kids, we generally look at toys and especially robots that are programmable and have educational value. Sometimes it's fun to have a tech toy just for its entertainment value and Zoomer Chimp definitely ticks that box. 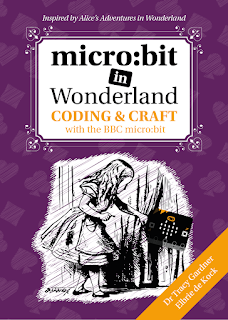 It is packed with some cool tech (although not programmable in the traditional sense). Disclaimer: Spin Master sent us a Zoomer Chimp to review. This is not a sponsored post and as always our opinions are our own. Zoomer Chimp comes in a rather large and impressive looking box. Note, it's easier to open it from the bottom and you'll need some scissors to cut the ties holding the toy in place. You get an instruction manual, standard USB charging cable (no wall charger) and command / reference card in English and German. If you're planning to get this as a Christmas gift, we recommend you charge Zoomer Chimp the night before. It takes approximately 1 hour to charge fully. 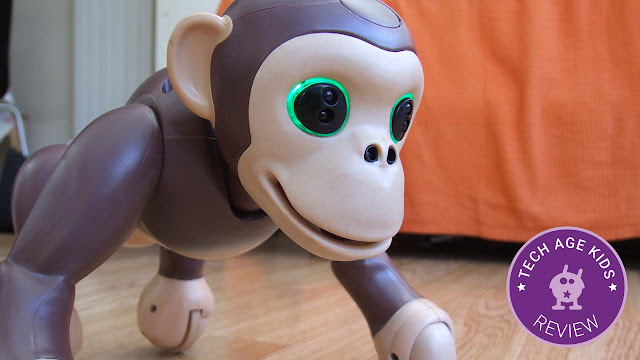 Our first impressions of Zoomer Chimp, is that it's loud, fun and does surprising things. My kids most enjoyed the burps, farts and silly noises - a true sign that Spinmaster understands child humour. Under the surface, there is some great tech, making the chimp interactive and animated. 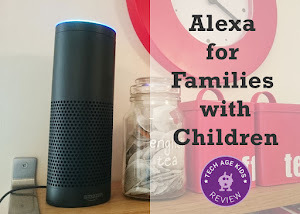 It's a bit frustrating to get it out of the box and have to charge it first, so make sure you do this before you get the kids involved. 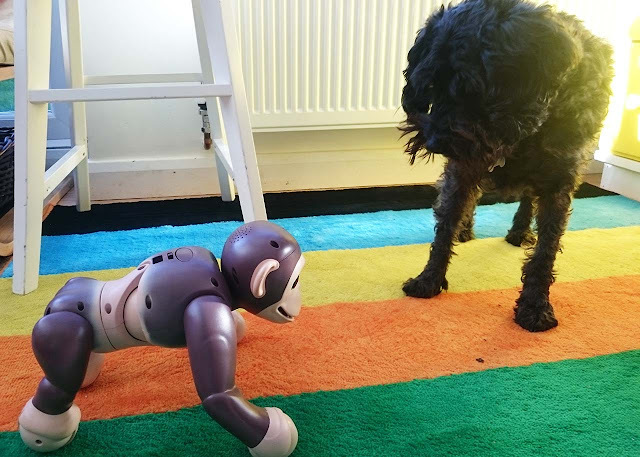 Once Zoomer Chimp was charged, my boys had lots of fun giving it voice commands and chasing our poor dog with Zoomer Chimp in guard mode. I was impressed with the animatronics in the chimp's face. There is a rubber-like plastic on the face which is pliable to allow the mouth and brow to move and show expression. 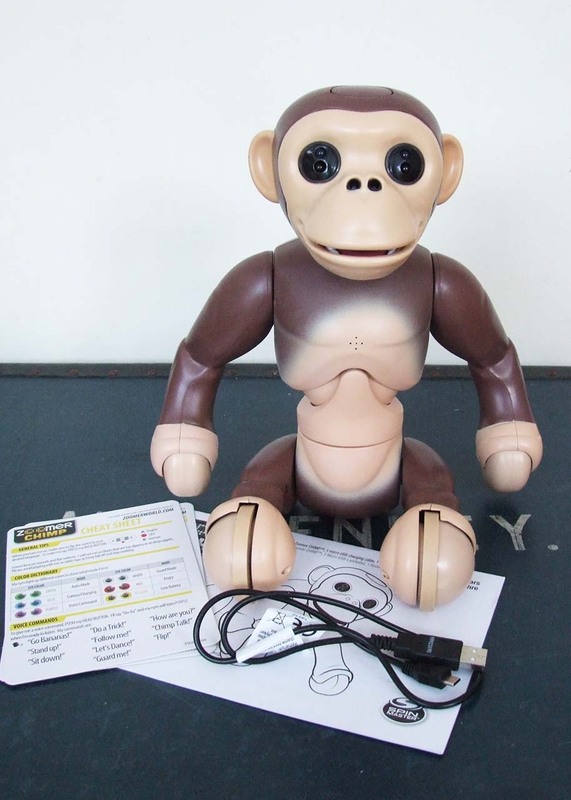 We really like that Zoomer Chimp comes with a USB charger and didn't have to struggle with changing batteries. It takes about 1 hour to charge for 15 min of play time. Make sure the switch on the back is on the "red dot" when you charge Zoomer Chimp, the eyes will turn blue when it is charging and green when it's fully charged. The eye colours are the main indicators of what mode the chimp is in. Keep the reference card handy when you first start playing, to know which commands to say. We were really impressed with the voice recognition capability of Zoomer Chimp. The chimp managed to understand my non-native accent and my son's British accent. It had a little difficulty understanding the excited shouts from my 6 year old though. We thought the chimp was better at "listening" to voice commands than our Meccanoid robot, which tends not to like too much background noise. Activate the voice command setting by pushing the button on top of the chimp's head, wait for the eyes to turn purple and then clearly speak your command. There are distance sensors in the eyes and nose, which allows it to really interact. You can push it back by holding your hand in front of it's face. When it is in guard mode, the chimp will lurch forward when it senses anything in front of it. My boys absolutely loved this feature. Much like the Coder MiP from WowWee, the Zoomer Chimp has some impressive balancing technology. The chimp can stand up straight and even dance or "Go Bananas" whilst keeping its balance. It's mostly on all fours, can sit and do impressive flips. Our favourite movement, was when the cheeky chimp wriggles his behind in the air! Zoomer Chimp will make a brilliant Christmas present, which will entertain and delight all members of the family. It's the type of toy you'll want to show off to your friends and get out every now and again. It's a shame it only lasts approximately 15 min of play time, but we get that it needs to power a lot of tech to make the Zoomer Chimp move and interact. Personally after 15 min, it's about time to have a break from the chimp noises! 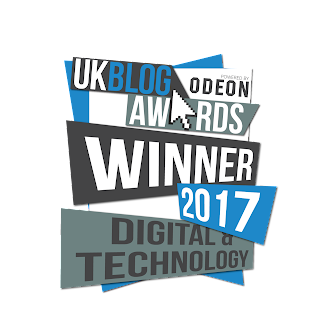 We do like all the cool tech used to make Zoomer Chimp. The eyes that light up, can look a bit scary for a young child, so make sure you introduce the toy and talk about why the eyes light up. Zoomer Chimp is recommended for ages 5+ which seems about right, especially with all the noise and silly sounds that comes out of this chimp!